After it closed, the steelmaking campus became the largest Brownfield redevelopment site in the United States, honoring the factory’s history and workers while developing one of the country’s largest Arts and Cultural organizations – Arts Quest – as a way to bring economic development to the area. Want to get within inches of those Blast Furnaces? Bring out your inner engineer on several walking tours and museum visits? Take a Blacksmithing class? Go on a behind the scenes tour of a Decorative Arts museum? Watch a classic guitar being made? Learn the evolution of the Mack Truck? You can do it all, plus eat like a Steel Magnate and stay like a tycoon on this Lehigh Valley PA Getaway. VISIT: National Museum of Industrial History, a Smithsonian Affiliate. Situated inside Bethlehem Steel’s 1910 Electrical Repair Shop, this soaring museum is loaded with completely restored innovations of yesteryear, and in addition, houses a collection of industrial machines from the 1876 International Exposition in Philadelphia. It’s an interactive and impressive look at ingenious feats of engineering, developed without the aid of computers. There are buttons to push and interactive exhibits for the kid at heart. Crank the Flywheel, engage gears, “fly” over a propane refinery in a virtual hot-air balloon, and place your face in a welder’s helmet. You can also see rare video footage of macho Victorian men doing unbelievably dangerous things, like messing around with a fiery block of steel, testing out the new 1891 Steam Hammer that comes down nearly on top of their heads. OSHA? What’s that? The best way to hear the stories and learn some hair-raising history is by guided tour. Learn the significance of the artsy shadow box displaying metal files from Nicholson File Co. See the first table saw ever manufactured, and the first compressed ammonia “chiller” ever made, initially for beer makers in Switzerland. The 1914 Corliss Water Pump – built for the city of York PA – was in bad shape when it arrived here, but restorers found a chip of its original color, so it’s been returned to a lustrous green. By May 2019, say docents, the ole pump be operational once more. Of course the heart of the museum is Bethlehem Steel, which was the largest battleship builder in the world during WWII. Find out the difference between cast, forged, and rolled steel I-Beams, and H-Beams. The advent of these stronger beams enabled the building of skyscrapers to unimaginable heights, and transformed the skyline of NYC (80% of which was built with Bethlehem Steel). In the 1890’s the Lehigh Valley was replete with Silk Mills. Visitors can feast their eyes on several computer-like Jacquard Looms that wove complexly patterned textiles, some that ended up in the White House. Another exhibit highlights Walter Snelling, the chemist who founded the propane industry. To ship the explosive gas, 63,000-gallon propane distribution tanks were fabricated by, you guessed it, Bethlehem Steel, and sent by railroad all over the country. Open Wed-Sun 10-5, $12 adults, $9 kids. WALK/PHOTO OP: The Hoover-Mason Trestle. Hovering 46 feet above ground and adjacent to the 250 ft tall blast furnaces, this Bethlehem Trail Park is New York City’s HighLine on steroids. Start in the SteelStacks Visitor Center (across a large parking lot from the National Museum of Industrial History), and climb two stories (or take an elevator) to the steel walkway, which traverses the tracks that transported raw materials to the furnaces. Even if you’re not on a guided tour, you’ll get a pretty good overview of what happened here from excellent signage and informational plaques. TOUR: Lehigh University. Established in 1865 by Asa Packer, who, with Robert Sayre (see below under Where to Stay) founded Bethlehem Steel, the mountainside Lehigh University encompasses multiple Historic Buildings. Be sure to check out the National Civil Engineering Landmark, Fritz Engineering Laboratory, donated by and named for John Fritz – Bethlehem Iron Company’s first Chief Engineer; and Linderman Library – listed among the country’s most beautiful college libraries. Check website for tours, or take a self-guided tour. VISIT: Kemerer Museum of Decorative Arts, a Smithsonian Affiliate. When grief-stricken Annie Kemerer lost both her son and husband to untimely deaths, she turned to decorative arts collecting for comfort and beauty. Kemerer died in 1951 bequeathing her entire collection to Historic Bethlehem. In 1954 Kemerer’s decorative arts collection was established on the Moravian College Campus, and in 1966, Pennsylvania’s only museum dedicated to the decorative arts moved to its permanent spot – which unites three separate buildings into one great institution. Highlighting three centuries of style and design throughout period-interpretive rooms and galleries, you’ll encounter tons of Bohemian glass, needlework, tall case clocks, cast iron toys, furniture, landscape paintings, and so much more. Because the 44 shrunken structures and over 6,000 figures and furniture, dating from 1830 to 1933, are so fragile (not to mention falling apart from use), they require this temperature-controlled environment. Prime kept her collection, ranging from single and affordable “box rooms” to the 1933 Tiny Toy Mansion that came fully furnished and cost as much as a brand new car, in her Manhattan apartment. After her death, friends photographed each miniature house, so that museum curators would know where each piece fit. “Betts” placed each of them purposely, often at odd scale (a minuscule princess next to a giant bathtub twice her height) but always mindful of the period. This is a perfect collection for this museum – as each structure showcases the decorative art and interior design of its day. A Behind the Scenes Dollhouse Tour (1 1/4 hours) takes you inside the 2-story vault to study up close each of these handmade and mass-produced mini-buildings. Even if you don’t take the tour, this museum is a must-see for anyone with an interest in interior design. Open Fri & Sat 11-4, Sun 1-4, $12 One Site Pass, $20 Multi-Site pass includes all open attractions in Historic Bethlehem. TOUR: Historic Bethlehem (20 Structures including Sites and Museums). Why have Moravians remained so obscure? Though many of the practices have changed over the years, there are still a million adherents to this Protestant sect who read the “Daily Text” worldwide. (Copies of bible verses are cut into 365 strips, one for each day of the year, put in a bin, and randomly picked one by one for the Daily Text Book, published annually and translated into dozens of languages). So why the mystery? A visit here will help you understand. Visitors Center & Museum Store: Get your bearings, pick up information or begin your walking tour in the Goundie House, original 1810 home of Bethlehem’s Town Brewer and community leader, located on Main St. Open Tues-Sat 10-5, Sun 10-4. Start in the Moravian Museum of Bethlehem, known as the 1741 Gemeinhaus (“Community House”) to learn about this communal and orderly culture. The Gemeinhaus was a multi-purpose building – composed of living, working, and worship sections. Community members gathered in the “Saal” – a large chapel considered the first house of worship in Bethlehem PA.
A Christian denomination formed in 1457 (50 years before Martin Luther) as protest against the Catholic Church, the Moravians, who hailed from Moravia in what is now within the boundaries of the Czech Republic, were (and still are) progressive, industrious, and musical. Initially, the Moravians sought sanctuary in Saxony, on the land of Count Nikolaus von Zinzendorf, who also funded their community and missionary work. Zinzendorf came to the American Colonies in 1741 to check on one community of missionaries, naming the settlement Bethlehem during a Christmas Eve “Love Feast” – a celebratory ritual that still continues to this day, mostly for weddings and anniversaries. Revolutionary for the time, Moravians believed in equality for everyone: women, men, White, Black and Native. Though German was the lingua franca, 15 languages, including the tribal Mohican, Mohawk, and Lanape, were spoken amongst the group. Women were educated and held government positions, and Native Americans and African Americans who converted to Christianity were welcomed into the community. Single men, single women, widows, and married couples lived in “Choirs:” separated into communal dormitory buildings. Women wore distinct clothing: “bird beak” caps, and dresses with ribbons of different colors indicating youth, single, married, or widowed. Still considered prominent musicians, Moravians organized one of the earliest orchestras in the colonies in 1740, playing the latest music of Bach and Hayden. The Moravian Trombone Choir, established in 1750, was the oldest organized brass bands in the USA. And, astonishingly, they are still playing! If you’re in town on the 2nd Tuesday of the month, plan to hear “Bach at Noon” at the 1803 Moravian Church, 12:10-1pm, free. Single Sister’s House. Next door, step into the Sister’s House for an idea of how the community incorporated women in art, medical care, farming, and other trades. Women were ordained ministers, held their own services, and celebrated birthdays much like we do today, with cake and song. A pacifist sect, Moravians didn’t serve in the military, but during the French and Indian Wars, women kept rocks on windowsills to scare away, though not kill, attackers. The last single Moravian women moved out of the Sister’s House in 2007, and you can see her spare conditions and mailbox on the outside of her door. Apothecary. The tiny Rau Drug Store, established in 1743 and closed in 1950’s, is the oldest in the USA. More progressive medically than many at the time, Moravians didn’t practice bloodletting, instead prescribing bed rest and hydration for ailments. Delft Ceramic and glass medicine jars and bottles still line shelves, and a 1880’s prescription record book reveals the types of remedies prescribed and their cost, undeniably lower than it is today. God’s Acre Cemetery: As all Moravians were equally valued member of the community, tombstones are of similar size and lay flat on the ground. Americans of European, African, and Native descent are buried side by side. The Colonial Industrial Quarter (behind Hotel Bethlehem). Composed of ruins, restored structures, and replicas of industrial buildings, Bethlehem’s original Colonial Industrial Quarter was positioned at the base of the hill on Monocacy Creek where fast flowing water could power early industrial waterwheels. There’s a circa 1761 Tannery, a working Blacksmith Shop (where adults can take 3-hour intro classes, $110pp), a replica of the Luckenbach Flour Mill (rebuilt on the same footprint as the original, that now serves as a programming space), the Spring House, ruins of the Butchery, Pottery, and Dye House, and the historic Waterworks. The Old Town Waterworks, built in 1762, was the very first pumped municipal water system in the country and stands today as both a National Historic and National Civil Engineering Landmark. Positioned over a sweet water spring, the pumping station used foul water from the Creek to power the waterwheel that drove potable water to homes built uphill (safe from potential flooding). This system was in use for over 100 years, until the mid 1800’s. There are several ways to access the gardens, meadows, industrial buildings, museums, and sites that encompass Historic Bethlehem. A number of much lauded Walking Tours on each side of Bethlehem run weekends only in winter, and 6 days a week in warmer seasons – and are scheduled so that intrepid visitors can several in one day. Most begin in the Goundie House on Main St. The Rise and Fall of Bethlehem Steel Tour departs from Artsquest SteelStacks Visitor Center. DO: Listen to music, see a show, or participate in an art project year round at ArtsQuest on the Steel Stack Campus. 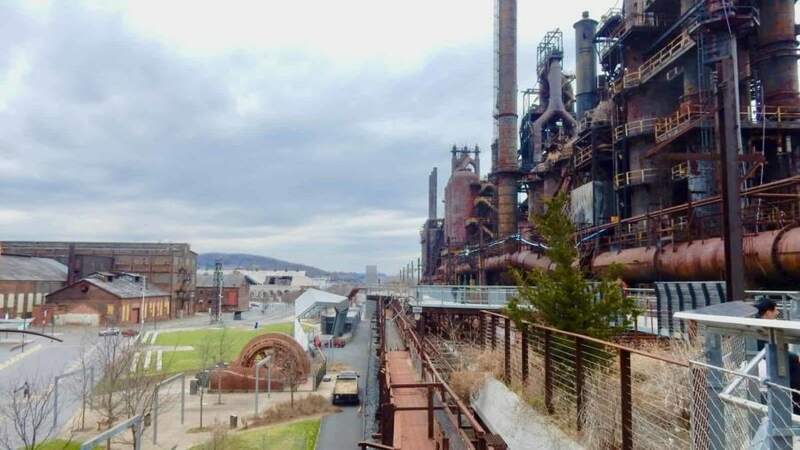 Arts Quest, which opened in April 2012 amid rusted out 230 ft. high smelters, on what is known as the “Steel Stack Campus.” Bethlehem’s flagship festival is Musikfest; a mostly free summer Blues and Rock music festival. Musikfest is the “Largest Free Music Festival in America,” where fourteen out of fifteen stages on twenty acres offer free access. Here’s a secret –stand on the Hoover Mason Trestle for great concert views. For free. TOUR: Download six self-guided Heritage Trail audio tours ($12). If you can’t make the organized walking tours of the Moravian Historic District or Bethlehem Steel complex, download the self-guided tours that take you through 275 years of Bethlehem History from Moravian settlers to Steel entrepreneurs and artists. VISIT/EAT: Sun Inn. Put your John Hancock where the original did – at the Innkeeper’s desk of the 1758 Sun Inn. Once on the frontier of these not yet United States, this place was probably a welcomed slice of hospitality and civilization when it received its first guest in 1760. George and Martha, John Adams, Benjamin Franklin, and most New American dignitaries found their way to this little outpost. The Sun Inn is now a micro-distillery with dinner service Wed-Sat. VISIT: Mack Truck Customer Center, Allentown. Currently the Testing and Development facility for all Mack trucks made in the nearby Macungie, PA plant, the Customer Center was opened as a museum in 2010. During WWI, soldiers driving Mack vehicles could see the figure of a bulldog in the trucks’ front grill, and a corporate symbol was born. In 1933, the Bulldog Radiator cap became the identifying feature of every Mack Truck. Plan on about 2 hours to tour the museum, which also houses and theater, sound room, and other interactive exhibits. Open, Mon, Wed, Fri 10-4 (last tour at 3), free. VISIT: America On Wheels. It’s a quirky collection of automotive vehicles: Pee Wee Herman’s bike sits next to a “lovely Austin-Healey,” go-carts, and antique cars. There’s an old Harley, a UPS Truck that with two million miles on its odometer and a Stanley Steamer steam-driven car. Moving in soon: classics from the collection of Nicola Bulgari. Perhaps most fascinating is a mock-up of “Guys Garage,” – a reconstructed garage from the 1950’s stocked with hand tools; not a hint of computer electronics. Open Tues-Sat 10-4, Sun 12-4, (last admission at 3pm), $10 adults, $6 kids. TOUR: Martin Guitar in Nazareth, PA (8 miles from Bethlehem). Smell the treated wood, tread on sawdust, watch artisans measure, sand, glue, and stain the parts of each Martin Guitar into a burnished, musical whole. Though cut and polished by machine, each guitar is still hand-assembled with the same care and precision that each of six generations of Martins have tendered since CF Martin opened its doors in 1839. The narrated walking tour takes you past craftspeople working on 8,000 acoustic guitars in various stages of assembly, with 250 completed every day. Tours last about an hour and run from 11am-2:30PM Monday-Friday. Free. Visitors Center and Museum open Mon-Fri 8-5. SHOP; If it’s a Kilt you’ll be lookin’ for, there’s a selection at Donegal Square; your source for everything Celtic. Next door, visit the “English-speaking World’s Oldest Continuously Operating Book Store,” the Moravian Bookshop, which has many books and a dizzying number of gifts, home goods and even artisanal foodstuffs and has never closed its doors since it opened in 1745. EAT: Apollo Grill. This tried and true Bethlehem landmark has been at the top of lists many years for a reason. The food is consistently good, and the vibe is wonderfully convivial. I love the appetizers here, which range from Artichoke Francese ($12), Black and Blue Tenderloin Salad ($15), to the uber-popular Shrimp Limoncello ($14), and oh my gosh favorite Garlic Bread ($9) which bears no resemblance to the standard version. This one – a sliced loaf of crusty/soft bread sits of a puddle of delicately flavored gorgonzola sauce and, alone, is worth returning for. EAT/DRINK: Social Still. There are plenty of vats and stills on view in this soaring brewery-distillery/restaurant carved out of a handsome bank building. The menu is small, but each dish is fantastic. I highly recommend the Pastrami Cured Salmon BLT ($15), which comes with a side of well-done skinny fries. Also great – Duck Wings ($13), Everyday I’m Trufflin’ Burger ($14), Mussels and Frittes ($12). Vodka, Gin, Rum, etc. samples $2.50 each, $10 for flight of 4. EAT: Zest Bar and Grill. On the 6th floor of a new “high rise” building on the corner of 3rd and New Streets, Zest’s good food vies with views of 3rd St. Bethlehem, the Steel Stacks, and the River beyond. This hot new place serves up trendy bites like Fried Cauliflower, Tuna Tartar, and more, along with excellent cocktails. DRINK/EAT: The Bookstore. Enjoy a Prohibition-era cocktail at The Bookstore, a low-ceiling, candlelit speakeasy that is literally hidden behind a bookshelf. Enter the low-ceiling, low-lit warren of rooms and peruse the drink menu book, listing a goodly number of inventive alcoholic concoctions. It’s one of the heppest date-night spots in the Lehigh Valley. EAT: McCarthy’s Red Stag Pub and Whiskey Bar. Visit the British Isles at McCarthy’s, a cozy, unpretentious place, where a pint, a shot of whiskey, homemade soups, and stews will put you right. EAT: Locals recommend The Vineyard for nothing fancy but very good red sauce Italian, Molinari’s for a more upscale Italian, Bolete for inventive cuisine in a historic home, The Mint Gastropub for trendy bites and booze, and Tapas On Main for great Spanish bites. STAY: Sayre Mansion. In 1858, prominent philanthropist Robert Sayre, chief engineer of the Lehigh Valley Railroad, a director of Bethlehem Steel, and trustee of both St. Lukes Hospital and Lehigh University, built his Gothic Revival stone mansion high on a hill overlooking his gritty enterprises. Turned into a boutique inn in the 1990’s, it is a Maven Favorite with its own review HERE. STAY: The Hotel Bethlehem was built for those natty steel and railroad tycoons in the 1920’s and has surged back to life recently as the most posh full-service hotel in the Lehigh Valley. It was built on the site of the city’s first structure – a two room loghouse. Find the plaque on the side of the hotel that states; “In this house on Christmas Eve 1741, Count Zinsendorf, conducting a Love Feast, named this place Bethlehem.” Try the Moravian Sugar Cake – it’s complimentary with your coffee in the lobby every morning. Traditionally elegant guest rooms are worth taking the slow creaky elevator to get to, and many have wonderful views of Bethlehem’s Historic District. 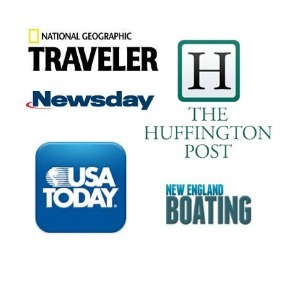 I love the way you’ve formatted this post…lots of eye appeal and easy-to-find info! And which one of you convinced the guy in the quilt to get out his bagpipes and pose for you?! Thanks LGW – I didn’t know that, but it makes complete sense. This is true. The song is obviously about Bethlehem, but Allentown rhymes with much more.